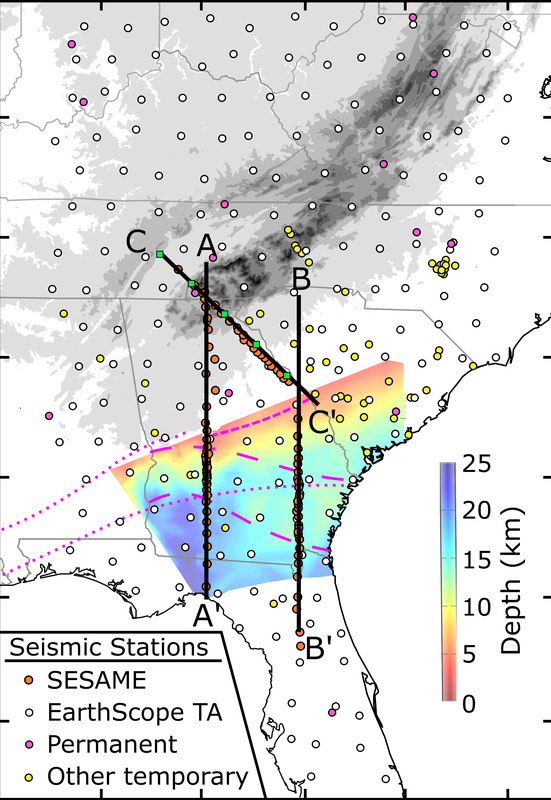 The Appalachian Mountains Researchers have developed a new picture of the continental collision that formed the southern Appalachians. PROVIDENCE, R.I. [Brown University] — Around 300 million years ago, the landmass that is now North America collided with Gondwana, a supercontinent comprised of present-day Africa and South America. That clash of continents lifted tons of rock high above the surrounding terrain to form the southern end of the Appalachian Mountains now seen in Alabama, Tennessee and Georgia. A team of geophysicists has reconstructed the terminal phase of that collision and developed a new picture of how it unfolded. The region in color denotes a shear zone where the continent of Gondwana slid atop proto-North America 300 million years ago. Emily Hopper (right) and Julia MacDougall set up one of the seismic stations used to image the subsurface of the southeastern U.S. The mostly likely explanation for that anomalous layer, the researchers say, is that it’s a shear zone — the contact along which Gondwanan plate slid atop of the proto-North American plate. The similarity between the two events tells scientists that there’s consistency over time in the way mountains are built, Fischer says. And that has implications for understanding the way the Earth’s crust has evolved. Hopper and Fischer’s co-authors on the paper were Lara Wagner of the Carnegie Institution for Science and Robert Hawman of the University of Georgia. The work was supported by the National Science Foundation’s Earthscope Program (EAR-0844276, EAR-0844186 and EAR-0844154).